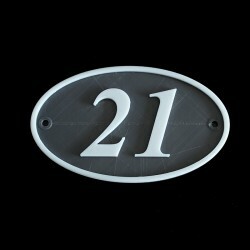 An attractive oval plaque displaying your house number. This is a 2 colour print with the plaque printed in grey and your number in white. Incorporates two 5mm dia fixing holes at 128mm centres. Please note that due to the nature of the 3D printing process minor surface defects can arise. We make every effort to keep these to a minimum and when they do occur they are only really apparent on close inspection. Made in PLA plastic and coated to protect from the elements. Just enter your house number in the customisation box below and then click "save" before adding to your cart.